French toast is an undeniably delicious way to use up leftover challah, and there's a reason few stray from the classic butter and maple syrup accoutrements -- they're super yummy. But so is a freshly-made fruit compote, like this luscious strawberry version enhanced with zippy ginger. If you want to gild the lily and drizzle on some maple syrup too, we don't mind. In a medium saucepan, combine the strawberries, orange juice, sugar, and ginger. Set over medium-high heat and bring to a simmer, stirring gently until the sugar is dissolved. Reduce the heat and simmer, uncovered, stirring occasionally, until the berries are soft, and the juices are reduced and syrupy, about 10 to 15 minutes. Remove from the heat and set aside. Preheat the oven to 300 F. Line a rimmed baking sheet with parchment paper. Slice the challah or challah rolls into 3/4- to 1-inch thick slices. In a large bowl, whisk together the eggs, milk or soy milk, vanilla extract, cinnamon, and nutmeg (if using). Place about 1/3 of the challah slices into the bowl (or as many as can fit comfortably), turning each to coat both sides with the egg mixture. While the first batch of bread is soaking, add 1 teaspoon of oil and 1 teaspoon of butter (or oil, if keeping the recipe dairy-free) to a large cast iron or non-stick skillet set over medium-high heat. When the butter melts and begins to bubble (or when the oil starts to shimmer), add as many challah slices as fit easily, taking care not to crowd the pan. Cook for 2 to 3 minutes per side, or until browned. Transfer the French toast to the prepared baking sheet and pop in the preheated oven to keep warm. Repeat the process, soaking and frying the bread in batches. Add more oil and/or butter to the pan between batches as needed. Serve hot with the compote, and/or butter, maple syrup, or a dusting of confectioners' sugar. Thick, fluffy slices of challah are perfect for soaking up the custard mixture, but you can vary the flavor and texture by opting for other types of bread. Brioche is a natural challah stand-in if you're going for a soft, luxurious French toast. Or try thinner slices of a hearty multigrain for a nutritious, whole-grain choice, or sourdough if you want some tang. 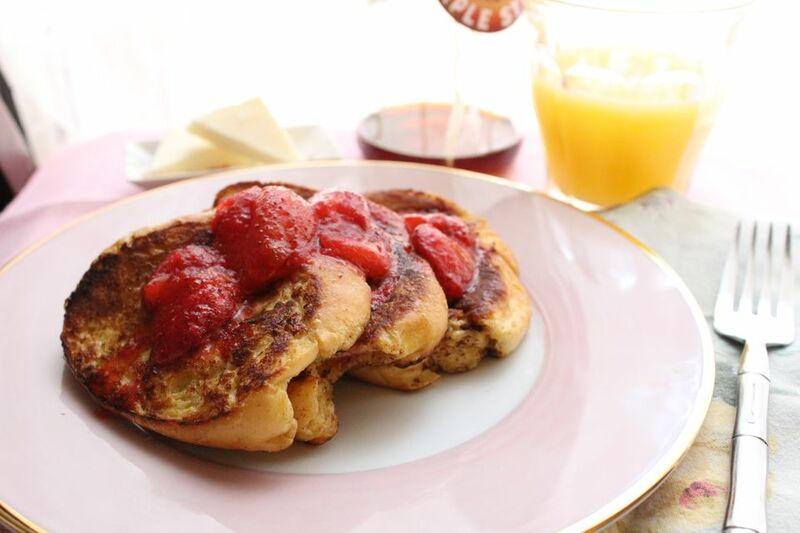 Think beyond Mother's Day brunch and that Valentine's treat for your sweetie -- in fact, think beyond French toast altogether. The berry compote is super versatile, and allergy friendly. Try it during Passover with matzo brei, or use it to dress up this flourless chocolate cake or a sponge cake. It's also perfect spooned over cheesecake on Shavuot.